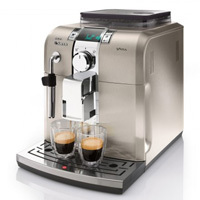 A compact super automatic espresso machine for $1,126.45, this Saeco model has a small footprint and low profile, letting you fit it under most overhanging cabinets. The controls are refreshingly straightforward, with a dial and buttons. The display makes use of helpful icons to make the coffee-making process intuitive and fast. We liked the overall appearance with its simple elegance and a brushed stainless steel exterior that doesn’t get smudged with fingerprints. The coffee it produces is fresh and rich, the steam wand always ready to add some hot water or froth.